As we all know, the Samsung Galaxy Note 8 is one of the phones to beat right now. Its latest challenger is the OnePlus 5T, a flagship smartphone for much less. How less? The OnePlus 5T has the specs that can compete w/ the Galaxy Note 8 for almost half the price. 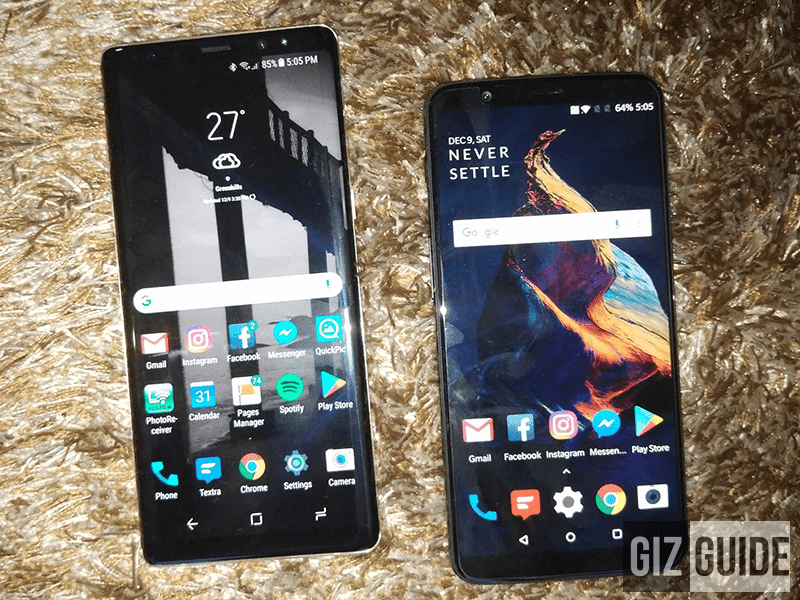 The Galaxy Note 8 retails for PHP 49,990 while the OnePlus 5T's price starts at PHP 26,990 only. Still, the Samsung Galaxy Note 8 has the better build, sexier design, water and dust resistance, larger screen, and HiFi audio. Specs is simply top notch overall. The OnePlus 5T is no slouch though. It also has an 18:9 screen even if it is lower in resolution, the GPU it is using is better for gaming, and it has more RAM and ROM if you'll get the 8GB RAM / 128GB ROM version. The best part? The OnePlus 5T is at least PHP 19,000 cheaper than the Galaxy Note 8. But, before jumping into conclusion, we'll do an actual comparison first.